for your computer graphics models. Combining the specialist skills of experienced still-life photographers with state-of-the-art, High Dynamic Range imaging, you can now have the ultimate in photorealism. You no longer have to worry about incongruous reflections in shiny surfaces or struggle for realistic lighting. Everything is exactly as it should be. I just downloaded Sampler 2 and within 10 minutes was looking at a perfect render scene that I'd been struggling with on lighting for two days. Seriously. I've used HDRI before, but your studio setups are perfect for product shots, which is our area of specialty in packaging design. My first image render with your HDRI image was spectacular. ...Anyway, Sampler 2 is the best $72 I've spent in 3D resources. 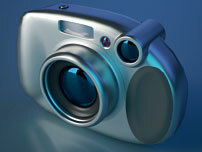 Virtual objects, professional studio lighting skills. The best of both worlds at a realistic price. Choose from a wide range of environment maps and backdrops designed to work with many object shapes, types and surfaces. They are compatible with most leading 3D software packages and available in multiple resolutions to suit your output needs. All you need to do is to select a lighting solution and appropriate resolution, order it by credit card from our secure online store and you could be putting the finishing touches to a striking, perfectly lit image within the hour.